The plastic deformation of collagen fiber networks was assessed using fibroblast cell spheroids on collagen fiber networks. Second harmonic generation (blue) was used to quantify the persistence of fiber alignment between a pair of cell clusters (green). 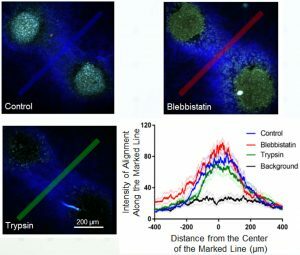 Persistence of fiber alignment was observed after cellular contractility was abolished using treatment with blebbistatin or trypsin. A collaboration (Wells, Shenoy) in IRG 2 studied the mechanisms of mechanical plasticity in collagen networks resulting from contractile forces produced by cellular aggregates placed within them. The Wells group used fibroblast spheroids seeded atop collagen gels to study the plasticity of collagen fiber networks due to cell-induced forces. Second harmonic generation imaging and spectral analysis enabled quantification of the alignment of fibers between a pair of contractile cell clusters. After 12 hours, dense tracts of aligned fibers were observed between nearby cell clusters. 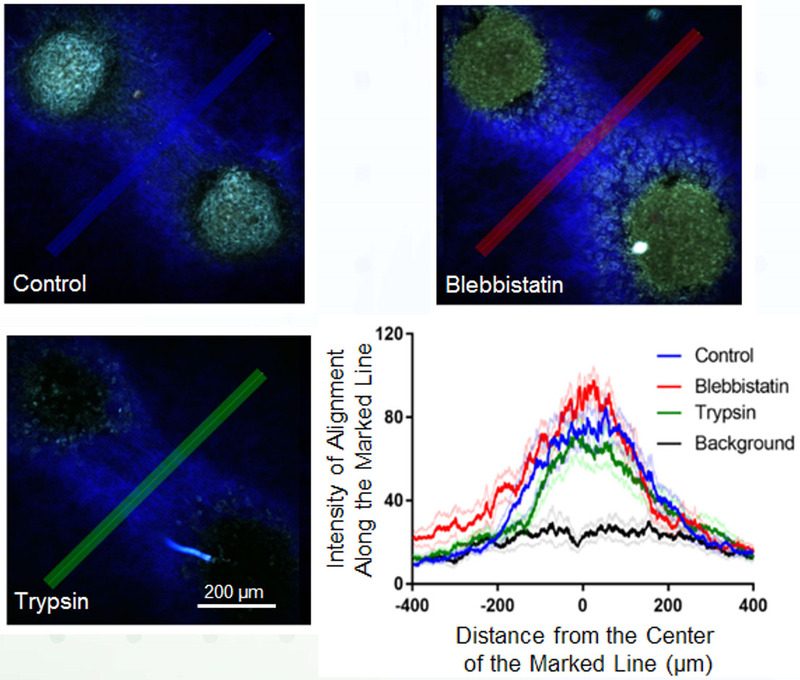 To investigate the persistence of cell-induced deformations in the collagen network, the Wells lab then abolished cellular contractility using blebbistatin and trypsin. Fiber alignment and densification persisted at the tracts, signifying plasticity of the collagen networks in the fibrous tracts. Shenoy’s group explained these using a chemomechanical fiber network model. This work verifies an IRG hypotheses that non-uniform displacements of fibers in networks under strain enables local chemical changes, e.g., new crosslink formation, that can be controlled to make new force-sensitive and force-reporting soft materials. Ban, E., Franklin, J.M., Smith, L.R., Wang, H., Wells, R.G., Liphardt, J., Shenoy, V.B. (2018). Mechanisms of Plastic Deformation in Collagen Networks Induced by Cellular Forces. Biophys. J. 114, 450–461.